Mizoram is one of the less travelled states in North Eastern region. It could be termed as a state of hills; cities are built up on the hill slops in almost all districts of the state. The state is best known for close-knit community sense. The Mizo people are less conscious about class distinctions, it is said. Mizoram is located on the southern tip of North East India hosting indigenous ethnic communities. However, culture of Mizo people has undergone transformation due to Christian Missionaries in the early 18th and 19th centuries. Almost all communities are Christianized, it is doubtful yet, how distinct are they now, in real terms. The state of Mizoram is surrounded by Myanmar and Bangladesh, two foreign countries. Assam, Manipur and Tripura are the Indian states bordering Mizoram. Aizawal is the state capital. The Lengpui Airport situated at about 35 km from Aizawal, the state capital is connected to Guwahati and Kolkata. Silichar in Assam (180 km from Aizawal) is the nearest railhead. Buses and private vehicles are available from Silichar to Aizawal. One needs to obtain Inner Lane Permit. Carry your photo ID and copies of your photographs. Entry formalities can be done at these cities: Kolkata, Guwahati, Shillong, Delhi and Silichar. Main occupation in Mizoram is agriculture. Up until recently Mizo people used to practice the age-old ‘Jhum’ (slash and burn) cultivation. Now the government has introduced new methods of farming. People are uniquely distinct and show strong community sense. 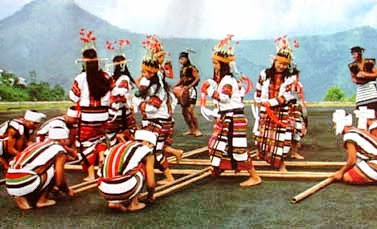 MIzo people are best known by their Bamboo pole dance which is called Cheraw Dance. They celebrate the festival of Thalfavang Kut Festival every year in the month of November. This is a harvest festival. Cultural games and dances will be showcased during then. 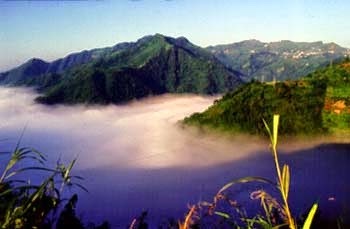 Mizoram offers cloud filled hills, emerald valleys, meandering streams, and unique tribal culture. Weather would be pleasant all through the year. September to May would be the best time to visit. Buy handicrafts, hand woven fabrics and bamboo crafts. Aizawal: This hill town is closer to many important tourist destinations in Mizoram like Reiek village on a mountain top, Durtang Hills, Hmuifang, Berawtang, Solomon’s Temple, and Khuangchera Puk Cave. Don’t miss to visit the World’s Largest Family in Baktawang Village. Aizawal has good many hotels and resorts with modern amenities. Make the city your base destination. Rejoice your shopping in the traffic free Bara Bazar. What else would be more interesting than to explore exotic forests, steep hills, waterfalls in Mizoram?! Visit Phawngpui Blue Mountain which is located near Myanmar border. It is at about 230 km from Aizawal. You would be enthralled by rare kind of orchids and rhododendrons flowers. Sibuta Lung Stone Architecture at Tachhip Village (20 km from Aizawal), Memorial of Chhingpui, Pangzawal Village, Lung Memorial Stone, Tualchang Stone slabs , Tomb of Vanhimailian, Vantawang Falls are some other tourist sites near Aizawal. Aizawal city is the main tourist point in Mizoram.